The arrival of Google's comprehensive satellite view some years ago, and more recently Street View, has been a huge benefit for anyone with even a passing interest in urbanism. To take advantage of these amazing mapping tools, from time to time I'll use them to explore a city or town — typically one with emergent characteristics in overall plan — partly for fun, and partly to see what can be learned. 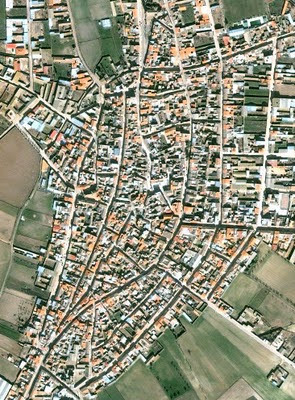 This week's location is the southern Spanish town of Aldea de Rey (literally "King's Town"), a village chosen not for its distinctiveness but for being representative of small towns of the region (and for being small enough to be shown in detail on this blog). The central square is easy to pick out. The road network surrounding it appears to have grown gradually over time: an initial "spindle," clearly discernible in the top half of the photo, encompasses most of the town square; to that initial shape is appended an addition angling to the southwest, which doubles or triples the size of the town while retaining the overall spindle shape. Finally, a series of straighter roads, mostly to the east, further expand the settled area. 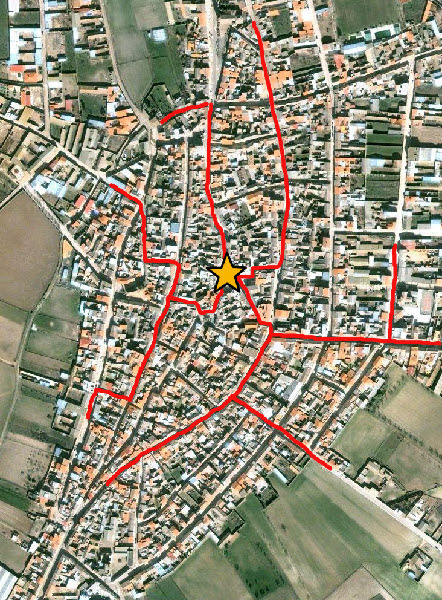 Apparently the central point of the town is accessible to nearly every resident by only a quick stroll. Even the newer streets bend around the gravitational pull of the center, keeping most residences within the five-minute walking radius. Although New Urbanist thought tends to emphasize the grid as a walkable alternative to the modern suburban pattern of arterial roads and cul de sacs, walkability is of course not an end in itself but rather a means to an end (arriving at one's destination, among other benefits). A formal grid of relatively low-density residential structures, however, as is pictured in the previous link, offers few non-residential destinations and no obvious focal point. Where centers of commerce, entertainment, etc. do exist, the grid may inhibit walking by failing to offer diagonal "shortcuts" and forcing the walker to follow a lengthier zig-zag path. The cul-de-sac approach, for all its failings, does at least acknowledge a hierarchy of streets and therefore features locations which are more central than others. 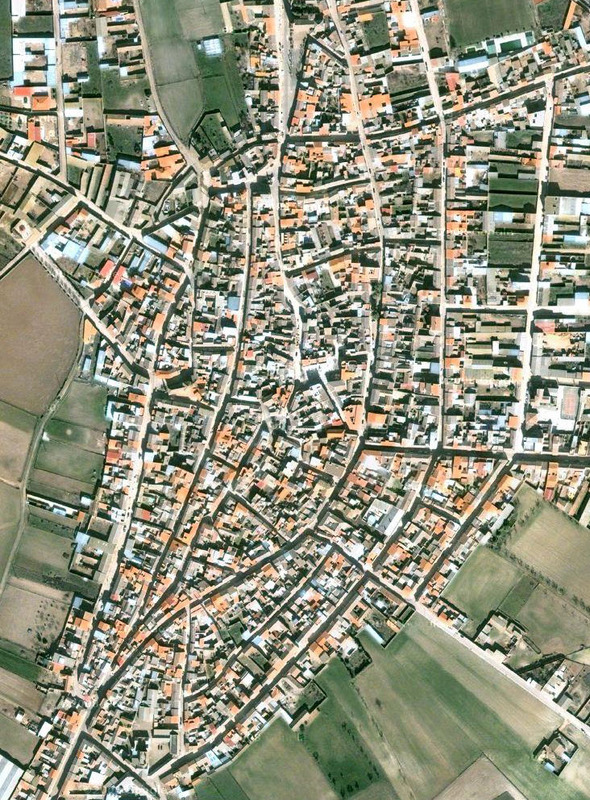 The town of Aldea de Rey offers one example of a layout that combines the connectedness of the grid with a centered focus that will attract the pedestrian volume sufficient to support retail and other businesses. The grid's main benefit is for people driving. Typical medieval "biomorphic" street layouts are in fact quite fine for walking. Either you already know the way, or, if not, you can stop at any time and look at a map. The problem with these complex layouts when driving (besides that their streets are hard to drive in) is that it is difficult to stop and look at a map. This might seem like an odd notion, but go to a medieval-type city and walk around with a map and you'll see what I mean. It is no problem at all. And much more interesting!